Have you ever heard of Pig Pickin Cake? I had to look up the meaning behind this cake, because of the odd name. What is a Pig Pickin Cake? Well now that you know how it got it’s name, you’re wondering, what is it exactly? My Pig Pickin Cake recipe (Pineapple Orange Cake) is a cake mix mixed with a can of mandarin oranges, egg whites, and applesauce (I clearly lightened it up a bit from the original southern version). You then top this cake with a mixture of pudding mix, crushed pineapple, and Cool Whip. It’s seriously so light and refreshing and the perfect summer treat. But, it’s also perfect in January when you are OVER the heavy butter cookies and candies, but still want a sweet dessert! Start by preheating the oven to 350 degrees F. Line a muffin tin with cupcake liners. 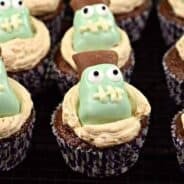 This recipe makes 24 cupcakes. 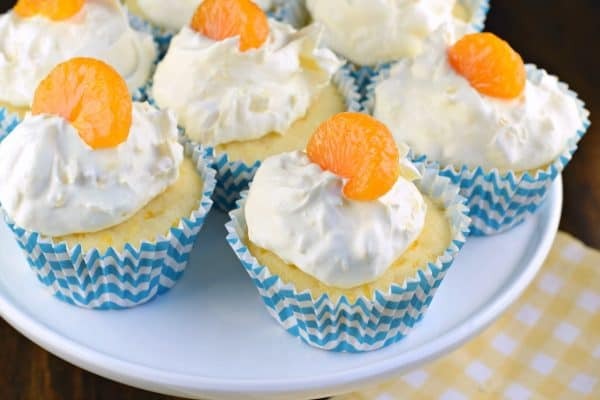 In a large bowl, add a white cake mix, a can of mandarin oranges in their own juice (do not drain), egg whites, and applesauce (no sugar added). Beat cake mixture for two minutes, scraping down sides of bowl as needed. Spoon into muffin cups until batter is evenly divided between them. Bake for 18-20 minutes, until toothpick inserted into the center of cupcake comes out clean. Remove from oven and cool completely before adding frosting. For the frosting, combine a can of crushed pineapple (with own juices, undrained) to a box of instant vanilla pudding mix. Mix with a spoon until combined. Fold in Cool Whip. Scoop a dollop onto each cooled cupcake. 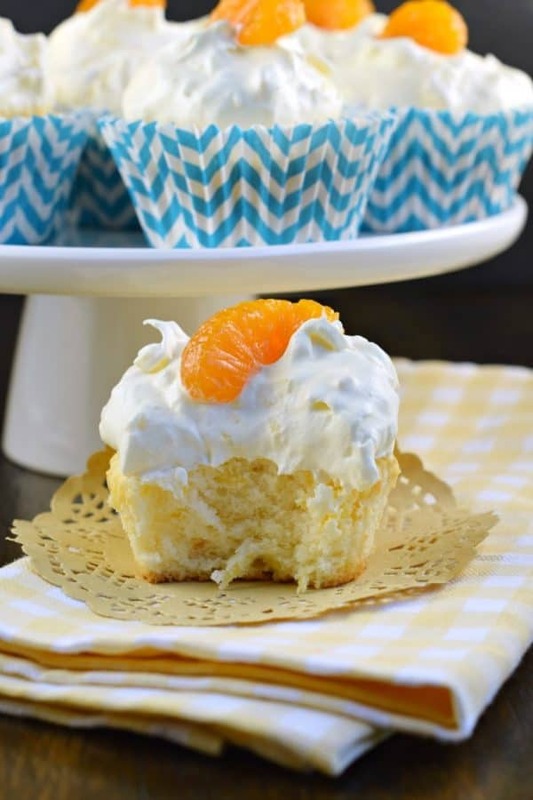 I used an extra can of mandarin oranges to garnish each cupcake with a slice of orange. Totally optional. 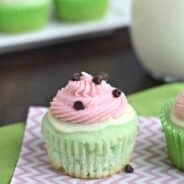 Refrigerate cupcakes for one hour or more. Serve within 4 days. ENJOY! Indulge in one (or more!) 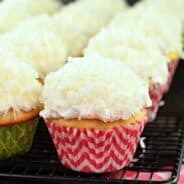 of these Skinny Pineapple Cupcakes for dessert! Made with only 3 ingredients you can be enjoying one of these no guilt treats tonight! 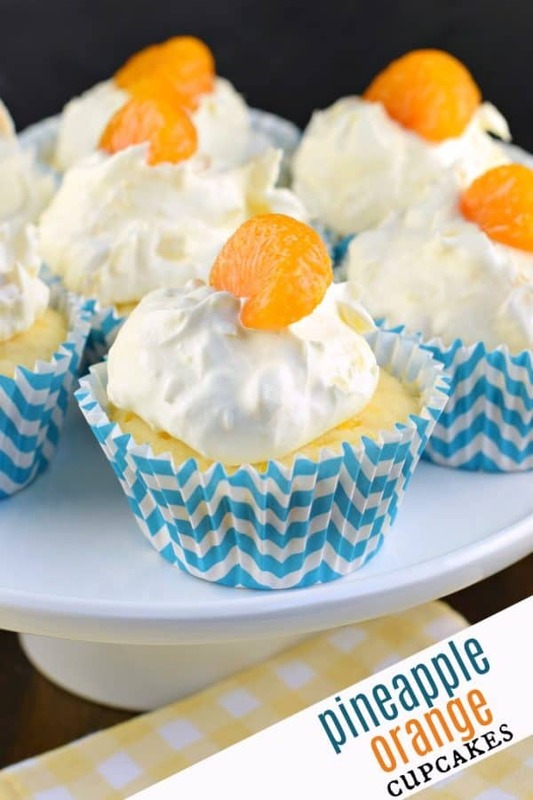 Incredibly easy, these Lemon Pudding Cupcakes are moist and delicious! 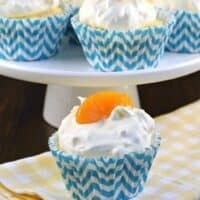 Topped with a creamy, light lemon frosting, you’ll love to sink your teeth into one of these cupcakes! 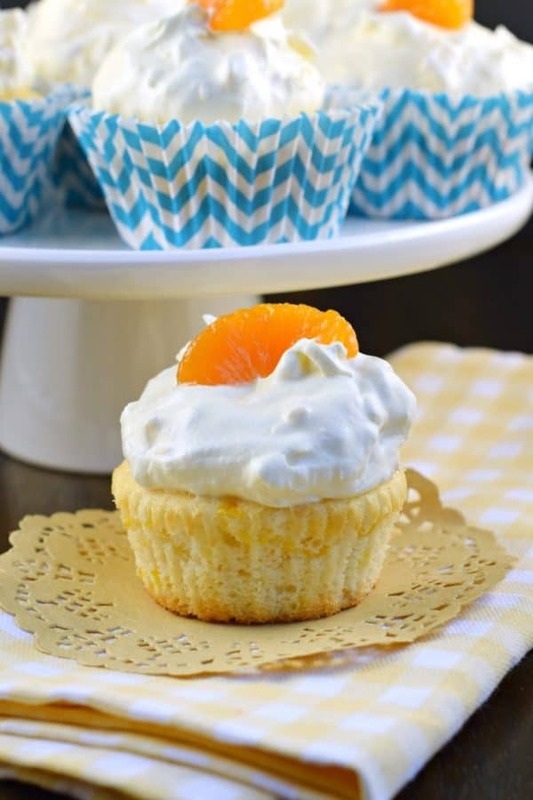 Crazy moist and fluffy, these Banana Pudding Cupcakes are the perfect dessert! 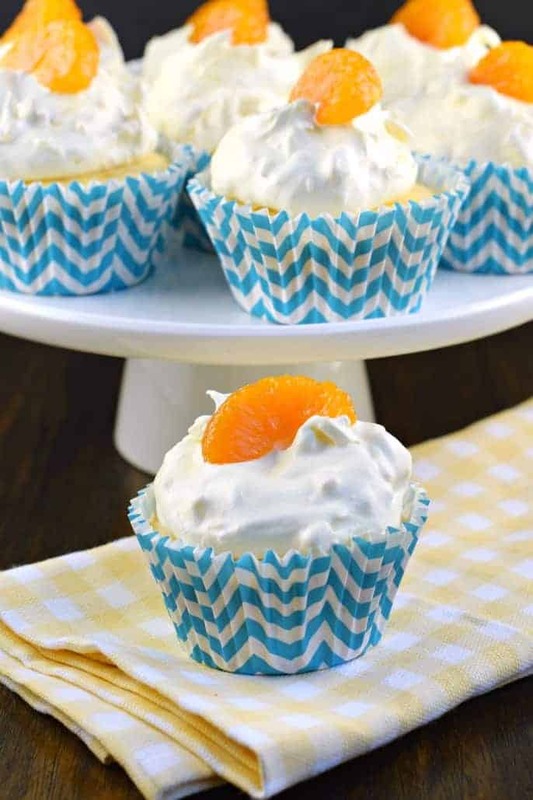 These Pineapple Orange Cupcakes are an easy, light dessert idea that are nearly guilt free! Preheat oven to 350 degrees F. Line a cupcake tin with paper cupcake liners. Set aside. In a large bowl mix white cake mix, mandarin oranges (with liquid), egg whites, and apple sauce. Beat for 2 minutes. Spoon cake batter into cupcake liners, until evenly distributed, about 2/3 full. Bake cupcakes for 18-20 minutes, until toothpick inserted in the center is dry. Remove from oven and cool cupcakes on wire rack, completely. For the frosting, in a bowl mix together the crushed pineapple (with juices) with the pudding mix. Fold in Cool Whip. Spoon frosting over each cupcake. Add a slice of mandarin orange for garnish, if desired. Refrigerate one hour or more. Store in airtight container in refrigerator for up to 4 days. ENJOY. I make a cake (didn’t know it was a pig pickin’ cake lol) just like this one during the summer months and love the light orange taste highlighted with sweet pineapple. Great idea to make it into cupcakes for a little more portion control. Ohmygosh these are LEGENDARY! So light and fluffy and flavorful! I am now on a Ketogenic Diet so I wish to UNSUBSCRIBE to your site. I have unsuccessfully tried twice but I continue to receive your emails. Please direct this to your website people so I can unsubscribe. Thank you. Your unsubscribe notation is not found on your site. Please amend.